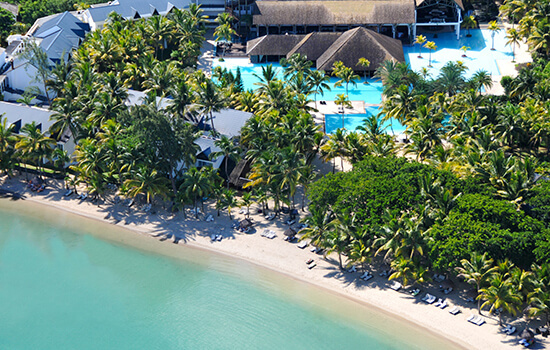 Mauritius is a beach lover’s paradise. Pick the perfect resort and you’re guaranteed a truly unforgettable beach holiday. 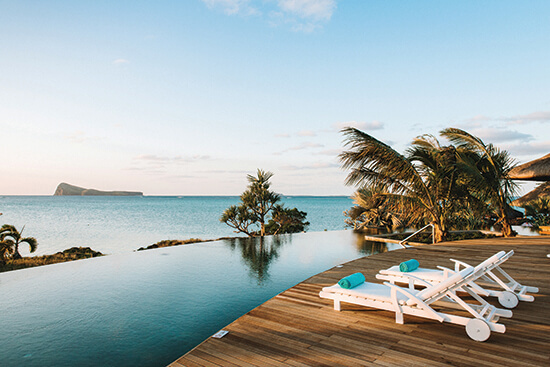 From family-friendly hotels offering babysitting, kids’ clubs and expansive playgrounds, to peaceful adults only havens with only a handful of rooms; this Indian Ocean destination promises something for everyone when it comes to crafting an unforgettable holiday. With such a wide array of hotels to choose from, knowing where to start can be daunting. To help solve the confusion, I was lucky enough to visit the best properties on the island during a recent whistle-stop tour of Mauritius. Whether you’re Escaping with babies or older children, this resort caters to all. Situated on the north coast and boasting two private islands for the exclusive use of guests, the spacious family rooms here are decked out in contemporary rustic chic designs. If the kids’ club set in a former fishing boat isn’t enough, youngsters will be delighted by the Zilwa mini-club’s mascot, a Mauritian dodo. Adults can really let the relaxation set in during a catamaran cruise, or indulge in a treatment at Vilaz Masaz by Spa Attitude. During my stay, I had lunch on private island Gran Zil, which is not to be missed – I'm talking succulent barbecued chicken and prawns, mouth-watering fresh fruit and ice-cold coconut milk, served in a truly breathtaking setting. Afterwards, take a dip in the crystal-clear Indian Ocean – the only sound you will be able to hear is the gentle lapping of the waves. Stay there on our Zilwa Attitude beach holiday. Sleek and sophisticated suites and villas await you at this romantic paradise, near the quaint village of Belle Mare. Service here is exceptional, and staff will be anticipating your every need from the moment you arrive. From handwritten notes to really taking the time to get to know guests, the team will go above and beyond to make sure your stay is unforgettable. At the heart of the resort is the glittering pool – the largest on the island – which is perfect for floating around. A plethora of unique dining experiences are just waiting to be discovered. The tapas menu at the Amari restaurant is personally prepared by Michelin-starred chef Vineet Bhatia. If you’re still not convinced, he was dubbed “the finest modern-Indian chef anywhere” by The Times' food critic AA Gill. I arrived at this hotel by catamaran at dusk – a truly magical way to catch the first glimpse of your new home. Located at the water’s edge on a sheltered cove, as soon as you step off the boat you are greeted by an attentive staff member waiting to hand you a cold towel and a chilled glass of Champagne. Soak up the peaceful atmosphere as you watch the world turn golden. Exclusively for adults, this award-winning retreat has everything you could need from a luxury Escape, from a shimmering infinity pool to suites with magnificent views and secluded restaurants which ooze romance. This newly-opened retreat is the perfect all-inclusive Escape. Here you can choose from executive beachfront adult suites, couples suites and family suites, and there is also a separate adults only wing offering privacy and seclusion. The expansive pool stretches around the resort. After working up an appetite with a few laps, dine at Lime, a dedicated sushi bar sitting directly on the beach and serving delectable tempura prawns and fresh sashimi. There is a real focus on dining at this all-suite resort, with 10 restaurants to choose from. My favourite was The Bistrot, where I was presented with a mouth-watering rack of lamb which fell off the bone and tasted divine. Afterwards, while away the evening with cocktails on the beach, or dance until the early hours at the resort’s on-site nightclub. With breathtaking views of the undulating hills and crystal-clear water, there is so much to do at this spectacular resort. Or, if you'd prefer to do nothing, simply stretch out on the shimmering sands and relax with a good book beneath the warm rays. Just 61 suites and villas face the ocean. I would recommend upgrading to a villa for your very own private pool – there is nothing better than waking up and going for a quiet swim, surrounded by exotic tropical gardens, before breakfast on the terrace. The Nira Spa is out of this world and offers a unique range of therapies, featuring Ayurvedic techniques. Once you are fully rested, the biggest decision you will face for the rest of the day is where to eat. From casual beach barbecues to traditional cuisine served at the oceanfront restaurant, the opportunities are endless. Don’t leave without visiting the Rum Shed – a truly authentic Mauritian experience, where dishes are prepared in a wood-fired oven. 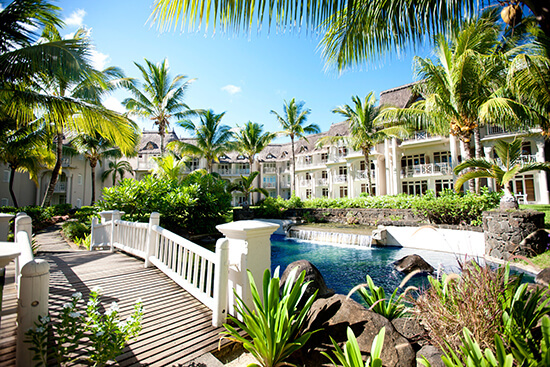 Sold on Mauritius? Speak to one of our Travel Experts today about booking your Escape holiday to the Indian Ocean.